Each year for the past several, I don’t know how long, Mike Kozak has been organizing a trip for the men of St. Bridget to visit Washington DC. 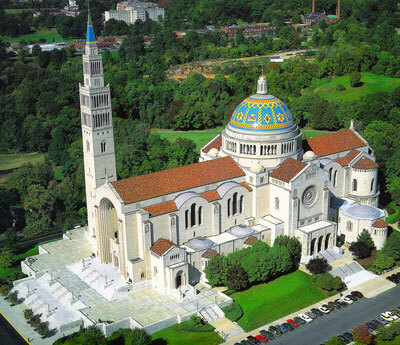 The primary task is a pilgrimage the Shrine/Cathedral on the campus of The Catholic University of America, and in the past to stop at some other Catholic religious sites in the area. The day is capped off with lunch at one of the city’s Irish Pubs. It has always been a wonderful day of fellowship, and we want to invite anyone interested to join the caravan north on Saturday March 14th. I have the happy news that Father Stefan will be with us for a private Mass at the Shrine this year. I have asked if there is a Slovakian Chapel at the Shrine suitable for Mass that we could reserve. Failing that, I have requested the Chapel of Our Lady of Czestochowa for our Mass. He is excited especially about lunch at the Irish Pub. More coffee at The Shrine 8:30 a.m. Guided Tour of Shrine 9:00 a.m.
Holy Mass @ 11:00 a.m. Please ask those who want to attend to email me at ckoz654@aol.com include their mobile phone contact, and let me know if they have a land yacht available for carpooling. Hope to see many of us this Saturday at the Diocesan Men’s Conference. The Holy Hour will be intended as a vigil for the March for Life and will include Exposition of the Blessed Sacrament and Benediction. Please make every effort to join the Church in prayer for the success of our pro-life efforts. January 22 – Buses depart for Washington DC, the March For Life. Join fellow St. Bridget parishioners at the 2015 March for Life and for Religious Freedom in Washington to show support for life from conception to natural death. Bus transportation will be provided by the Knights of Columbus. Come to the Columbian Center at 2324 Pump Road by 7:45 a.m. on the 22nd. The buses will return to the Columbian Center about 6:00 p.m. Please dress appropriately for outdoor weather, and bring your own lunch for the day. Seating is limited and must be reserved in advance. To reserve a seat on the bus, contact Brother Mike Kozak at ckoz654@aol.com.